Our Metallic Thread is a gorgeous choice for quilting and embroidery work. Available in 25 colors, including 2 variegated colors, Superior Metallic thread is strong enough to handle longarm machine quilting and commercial embroidery machines. Unfortunately, there are cheap metallics available in the market and they give Metallic Thread a bad name and image. Not all Metallic Threads are created equal. Some companies skip over manufacturing steps which results in a bad sewing experience. When priced per yard, you may be surprised to find that a small spool of cheap metallic with ~150 yds is more expensive than a spool of high-quality metallic with 500 yds. 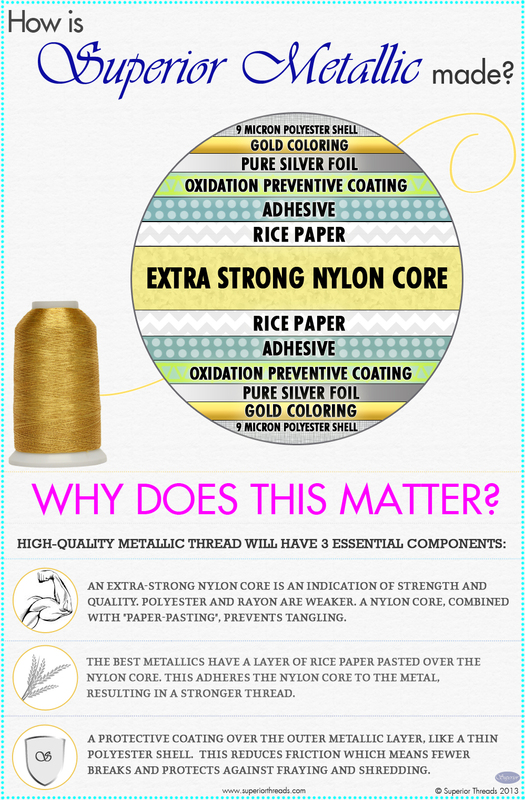 Click on the image below to view our infographic on what makes Superior Metallics thread so Superior. What makes Superior Metallics so superior? Not only do we use the finest raw materials to create this beautiful thread, it undergoes special processing to make it vibrant, strong, and smooth. Although Metallics are considered to be a delicate thread, if you loosen your top tension down to "1" (for home machines), use the correct needle size such as a Topstitch #90/14 (for home machines) and a size #19 or MR 4.0 (for longarm machines), and use a lint-free polyester thread in the bobbin, you will enjoy using metallic thread in your projects. View our Superior Metallic infographic.